The IDF medical team has set up a field infirmary at Minami-Sanrikucho, which was completely wiped out by the tsunami. IDF delegation chief in Japan. 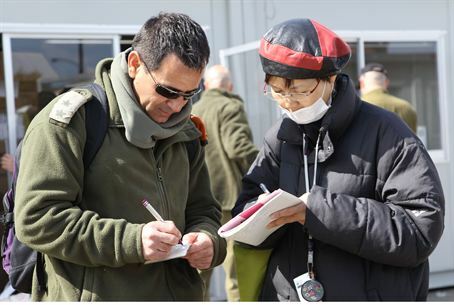 The IDF's medical team has set up a field infirmary at Minami-Sanrikucho, Japan, and is conducting an initial assessment of the situation in coordination with the heads of the Home Front Command and IDF Medical Corps in Israel. The Japanese government set up the buildings in which the clinic will be run. Members of the IDF team will provide their own food and water. The clinic is expected to remain open for approximately one month. On Saturday night, senior IDF officers and Japanese officials in Israel saw off the delegation at Ben-Gurion airport. Japan's Ambassador to Israel Haruhisa Takeuchi thanked the team as it prepared to leave. The IDF aid delegation landed in Japan on Sunday evening. An initial team left for Japan last week in order to assess needs in advance of the second delegation's arrival. Non-governmental Jewish groups have rushed to provide aid as well. Japan's Chabad-Lubavitch emmissaries remained in the country throughout the disaster to provide physical and spritual assistance, with some venturing out to the hardest-hit areas in order to assist in rescue efforts. Japan was hit by a 9.0 magnitude earthquake on March 11. The earthquake was followed by a massive tsunami that struck quickly, leaving many with no time to run for safety. More than 25,000 people remain missing or have been confirmed dead in the twin disasters, and many others were left homeless. The Daily Yomiuri reported nine days ago that despite intense rescue operations, "rescue workers have yet to find a single survivor or a body in tsunami-hit Minami-Sanrikucho." "Kobe fire department rescue team members, who also worked in areas affected by the Great Hanshin Earthquake, have been operating in Minami-Sanrikucho. But they do not have any idea of the whereabouts of the legions of missing people swept away after massive tsunami swallowed up houses. In all, 8,000 town residents remain missing." "Although we're reporting [the fact that] people are missing, it's impossible even to locate the houses in which they lived," Masafumi Inoue, 55, captain of the Japanese team, said.